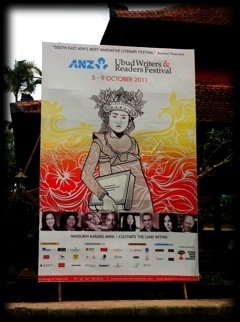 Here it is, our first official event of the Ubud Writers Festival…High Tea with Juan Gabriel Vasquez at the Biku Tea House in Seminyak. I can hardly keep my mobile to my ear at the crackling expletives being choked down the crackling phone line, worthy of any old sea-dog, but hardly expected from the beautiful mouth of a Princess! Tempers were soothed, ego’s were stroked…but that’s enough about me. The gig went on as planned except for one thing…the audience. Where the hell were they? 28 seats booked and paid for, but 18 of them didn’t show up! We held things off for half an hour before kicking into it, and boy, did those guys ever miss out, BIG TIME!! The conversation between our moderator, Geoffrey Williams (ex General Manager of the Australian Film Institute and Chambermade Opera Co.), and Juan Gabriel Vasquez, was absolutely captivating. And the audience was thrilled to have an up close and personal, intimate experience with the author, but again…that’s enough about me. This man’s life, his views and opinions not only sounded like rich dark chocolate flowing smoothly through his lips, but was filled with more conviction, understanding and heartfelt sentiment, than a soft caramely-nougat centre. He spoke with a worldly knowledge far beyond his years and I couldn’t believe he was younger than me (I jealously suspect he copied off his Grandfather’s exam paper). He spoke so passionately about his life and growing up in Columbia, but I was disappointed that not once, did he mention the cigars, quirky-eye and trench coat…oh wait, I think that was Columbo. Peter Falk’s TV detective from the 70’s…my bad. The actual event itself, went quite swimmingly. As would be expected, being helmed by Captain Jack (Fiona) Sparrow, we were definitely in safe hands. And dappling a little spanish into my MC announcements, was certainly acknowledged and appreciated by our Columbian guest author…if only he spoke Spanish. A great afternoon was had by all…now, quickly Robin…to the Batmobile! A quick change back into our tea bags, to brave the journey in the rain and the night on our scooter to our next gig in a couple hours…all the way back up in Ubud!